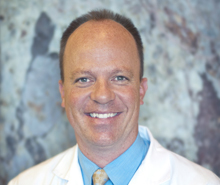 After earning his bachelor's degree from Brigham Young University in 1998, Dr. Anderson received his doctorate from the Oregon Health and Sciences University in 2002. He is a member of the WhiteCap Institute of Dental Implantology and frequently lectures at the WhiteCap Institute. He has also lectured at numerous continuing educational classes around the country. He is a member of the American Academy of Implant Dentistry, the International Congress of Oral Implantologists, the American Academy of Costmetic Dentistry, the Academy of General Dentistry, the American Dental Association, the Utah Dental Association, the Academy of LDS dentists, the Golden Key National Honors Society, the Phi Kappa Phi Honors Society, and the Beta Gamma Sigma Honors Society. He was his high school class Valedictorian in 1991. He and his wife have been married for over 15 years and have six children. He loves spending time with his family, is an avid college football sports fan, enjoys creating, reading, traveling, electronics, and movie theater popcorn. He is easy to talk with and strives to make life easier and more enjoyable for everyone he meets. We are certain that you will appreciate and respect the empathetic, detailed oriented, knowledgeable, and compassionate nature of his practice of dentistry. Dr. Anderson practices in both the Syracuse and Roy locations. "I absolutely enjoy the practice of dentistry. The intrinsic reward I experience after relieving someone from dental pain was unexpected when I began my profession so many years ago. Moving a patient away from the hassle of dentures and into dental implants brings such satisfaction for the patient and for me--it motivates me to strive for excellence and perfection in every procedure. I was always nervous to go to the dentist as a child. I had a lot of cavities and some dentists would make me feel ashamed. I promise you that you'll never feel that way in my care. I will do my best always and will follow the golden-rule when you are with me. Thank you for your interest in our practice. I'm looking forward to meeting with you--hopefully soon."